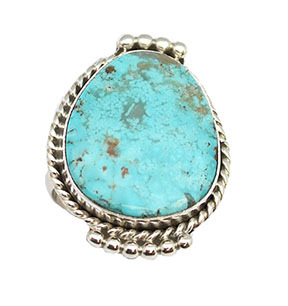 A free form natural kingman turquoise stone with sterling silver twist wire and drops for border over a lowdome shank. Each stone is a diifferent shape and size but measure between 1 1/8" - 1 1/4" long by 7/8" to 1" wide. It is Navajo hand made by Harrison Chee. Now only in light green with light tan matrix. Available in size 7 or 9. Choose when ordering. For matching bracelet search BRN775T.